Hi there! Today, another paper on the Yarkovsky effect. You know, this non-gravitational force which acts on the asteroid, especially if it is close enough to the Sun. After reading this post, you will know how it can reveal us the obliquity of an asteroid. I present you Constraints on the near-Earth asteroid obliquity distribution from the Yarkovsky effect, by C. Tardioli, D. Farnocchia, B. Rozitis, D. Cotto-Figueiroa, S.R. Chesley, T.S. Statler & M. Vasile. This paper has recently been accepted for publication in Astronomy and Astronomy. Imagine you want to know the rotation of an asteroid… but you cannot measure it directly. However, you can measure the orbital motion of the asteroid, with enough accuracy to detect an effect (here Yarkovsky), which itself depends on the rotation… measuring Yarkovsky is measuring the rotation! Easy, isn’t it? We know the orientation of its spin pole. We will call it the obliquity. Usually the asteroids spin in a few hours, which is very fast since they need at least several months to complete one revolution around the Sun. The obliquity is between 0° and 180°. 0° means that the spin axis is orthogonal to the orbital plane, and that the rotation is prograde. However, 180° is the other extreme case, the spin axis is orthogonal, but with a retrograde rotation. A direct measurement of these two quantities would consist in following the surface of the asteroid, to observe the rotation. Usually we cannot observe the surface, but sometimes we can measure the variations of the magnitude of the asteroid over time. This is directly due to the Solar light flux, which is reflected by the surface of the asteroid. Because the topography is irregular, the rotation of the asteroid induces variations of this reflection, and by analyzing the resulting lightcurve we can retrieve the rotational quantities. Very well, but sometimes the photometric observations are not accurate enough to get these quantities. And other times, the measured rotational quantities present an ambiguity, i.e. 2 solutions, which would need an independent measurement to discriminate them, i.e. determine which of the two possible results is the right one. It appears that the Yarkovsky effect, which is an alteration of the orbital motion of the body due to the inhomogeneity of its temperature, itself due to the Solar incident flux and the orientation of the body, i.e. its rotation, can sometimes be measured. When you know Yarkovsky, you know the obliquity. Well, it is a little more complicated than that. Since I have already presented you Yarkovsky with words, I give you now a formula. θs / θo: thermal parameters which depend on the spin period (s), and the orbital one (o), respectively. If you know Yarkovsky, you know A2, since you know the distance r (you actually know where the asteroid is). If you know all the parameters except ε, then A2 gives you ε. In fact, some of the other parameters need to be estimated. As you can see, this study is possible only for asteroids, for which you can know the Yarkovsky acceleration. Since it is a thermal effect, you can do it only for Near-Earth Asteroids, which are closer to the Sun than the Main Belt. And to measure Yarkovsky, you must simulate the orbital motion of the asteroid, which is perturbed by the main planets and Yarkovsky, with the Yarkovsky acceleration as a free parameter. A fit of the simulations to the actual astrometric observations of the asteroid gives you a number for the Yarkovsky acceleration, with a numerical uncertainty. If your number is larger than the uncertainty, then you have detected Yarkovsky. And this uncertainty mainly depends on the accuracy of your astrometric observations. It could also depend on the validity of the dynamical model, i.e. on the consideration of the forces perturbing the orbital motion, but usually the dynamical model is very accurate, since the masses and motions of the disturbing planets are very well known. The first detection of the Yarkovsky acceleration was in 2003, when a drift of 15 km over 12 years was announced for the asteroid 6489 Golevka. So, you have now a list of asteroids, with their Yarkovsky accelerations. The authors worked with a final dataset of 125 asteroids. The authors tried to fit a distribution of the obliquities of these asteroids. The best fit, i.e. which reduces the distance between the resulting obliquities and the Yarkovsky acceleration that they would have produced, is obtained from a quadratic model, i.e. 1.12 cos2(ε)-0.32 cos(ε)+0.13, which is represented below. 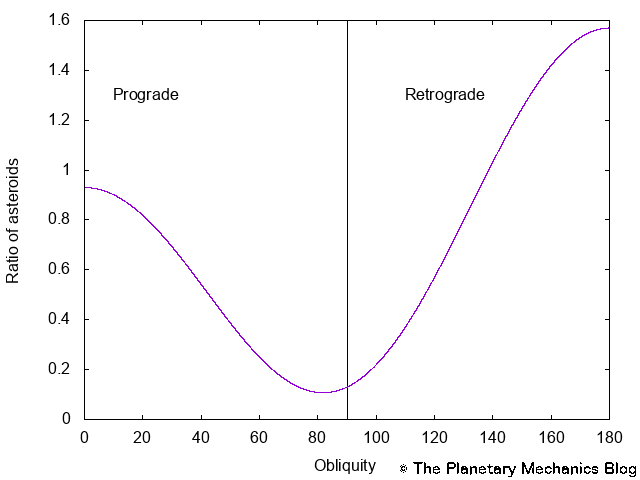 Distribution of the asteroids with respect to their obliquity. What you see is the number of asteroids with respect to their obliquity. The 2 maxima at 0° and 180° mean that most of the asteroids spin about an axis, which is almost orthogonal to their orbital plane. From their relative heights, it appears that there about twice more retrograde asteroids than prograde ones. This is consistent with previous studies, these obliquities actually being a consequence of the YORP effect, which is the influence of Yarkovsky on the rotation. and the one of Massimiliano Vasile. Hi there! Today I present you a theoretical study, which explains why some asteroids present cavities in their equatorial plane. The related paper, Equatorial cavities on asteroids, an evidence of fission events, by Simon Tardivel, Paul Sánchez & Daniel J. Scheeres, has recently been accepted for publication in Icarus. When you see a cavity, i.e. a hole at the surface of a planetary, you… OK, I usually assume it is due to an impact. Here we have another explanation, which is that it spun so fast that it ejected some material. These cavities have been observed on the two NEOs (Near-Earth Objects) 2008 EV5 and 2000 DP107 α,for which the authors describe the mechanism. They both are small bodies, which orbit in the vicinity of the Earth, and they spin fast. You cannot see that 2000 DP 107 α has a small companion, so this is the largest component (the primary) of a binary asteroid. Their proximity to the Earth made possible the acquisition of enough radar data to model their shapes. We know that they are top-shaped asteroid, i.e. they can be seen as two cones joined by their base, giving an equatorial ridge. Moreover, they both have an equatorial cavity, of diameters 160 and 400 m, and depths 20 and 60 meters, respectively. The authors estimate that given the numbers of potential projectiles in the NEO population, the odds are very small, i.e. one chance over 600, that these two craters are both consequences of impacts. Such an impact should have occurred during the last millions of years, otherwise the craters would have relaxed. This is why it must be the signature of another mechanism, here fission is proposed. To have fission, you must spin fast enough, and this fast spin cannot be primordial, otherwise the asteroid would not have formed. So, something has accelerated the spin. This something is YORP, for Yarkovsky-O’Keefe-Radzievskii-Paddack. When you are close enough to the Sun, the side facing the Sun warms, and then radiates in cooling. This is the Yarkovsky effect, which is a non-gravitational force, which affect the orbit of a small body. When you have an irregular shape, which is common among asteroids (you need to reach a critical size > 100 km to be pretty spherical), your response to the Sun light may be the one of a windmill to the wind. And your spin accelerates. This is the YORP effect. These Yarkovsky and YORP effects have actually been measured in the NEO population. When you spin fast enough, you just split. This is easy to figure out: the shape of a planetary body is a balance between its own gravity, its spin, and if applicable the tidal action of a large perturber. For our asteroids, we can neglect this last effect. So, we have a balance between the own gravity, which tends to preserve the asteroid, and the centrifugal force, which tends to destroy it. When you accelerate the rotation, you endanger the body. But it actually does not explode, since once some material is ejected, enough angular momentum is lost, and the two newly created bodies may survive. This process of fission is assumed to be the main cause of the formation of binaries in the NEO population. 2000 DP107 α belongs to a binary, while 2008 EV5 does not. But that does not mean that it did not experience fission, since the ejecta may not have aggregated, or the formed binary may not have survived as a binary. Now, let us see how this process created an equatorial cavity. The author imagined that there was initially a mass filling the cavity. This mass would have had the same density as the remaining body, and they considered its size to be a free parameter. They assumed the smallest possible mass to exactly fill the cavity, the other options creating protrusion. As a consequence, the radius of the asteroid would have been larger at that very place, while it is smaller now. And this is where it is getting very interesting. In accelerating the rotation of the asteroid, you move the surface limit, which would correspond to the balance between gravitation and spin. More exactly, you diminish its radius, until it reaches the surface of the asteroid… the first contact being at the protrusion. The balance being different whether you are inside or outside the asteroid, this limit surface would go deeper at the location of the protrusion, permitting the ejection of the mass which lies outside, and thus creating an equatorial cavity. Easy, isn’t it? But this raises another question: this would mean that the cohesion at the equatorial plane is not very strong, and weaker than expected for an asteroid. How to solve this paradox? Thanks to kinetic sieving! The authors simulated a phenomenon that is known by geologist as reverse grading. In granular avalanches, the separation of particles occurs according to size, involving that the largest particles are expelled where the spin is faster, i.e. at the equator, which would result in a lowest tensile strength, which would itself facilitate the ejection of the mass, and create an equatorial cavity. This phenomenon has been simulated, but not observed yet. So, this is a prediction which should be tested by future space missions. By the way, the size of the companion of 2000 DP107 α is consistent with a protruder of height 60m. You get a binary, which may survive or not. More will be known in the next future, thanks to the space mission Osiris-REx, which will visit the asteroid (101955) Bennu in 2018 and return samples to the Earth in 2023. Does it have sandy tropics? The Near-Earth Asteroid Bennu. © NASA. The website of his lab, in which this research has been conducted.